Meath people have travelled the world and settled in many different countries, but all hold a corner of their heart for a little bit of the old country. To remind them of their homeland they gave their new homes names of places in Ireland. There is a Boyne in Michigan and a Navan in Ontario. The Royal County has produced many fine and respected people. 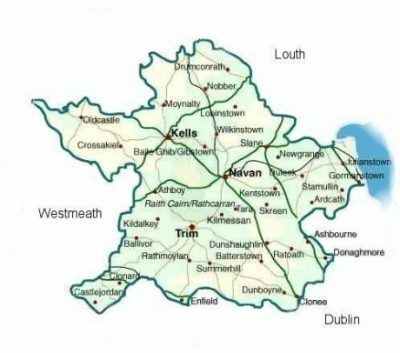 The proud name of Meath has been handed down from one generation to the next by the Irish emigrant families. Now many of their descendants look to Ireland and Meath to show them their roots. There are many sources available to those tracing their Meath ancestors. However it is advisable to first familiarise yourself with the type of records which are available and how to use them. There are a number of very good guides to tracing your roots in Ireland which should be read before and during your search. Meath Heritage Centre, Castle Street, Trim, Co. Meath, Ireland.